Doesn’t that look so gourmet? Can you believe it takes less than 30 minutes to make, and that most of the time is in the prep? 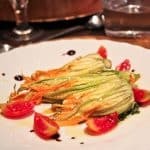 This is Part 2 of Cook like an Italian: Fiori di Zucca Ripieni (or: Baked, stuffed zucchini flowers with a ricotta filling. For Part 1, click here). 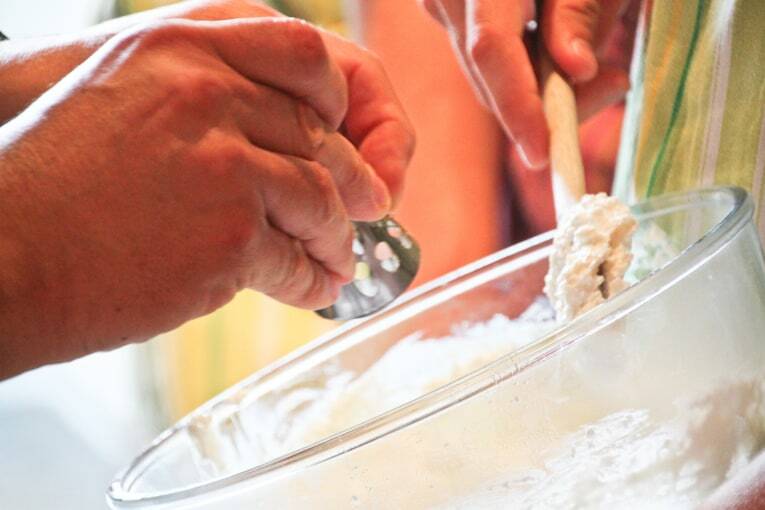 I had the wonderful experience of learning this recipe through Convivio Rome during our recent trip to Italy. And while the first recipe we made in our cooking class was extremely time intensive (2+ hours), this one was not at all! Made with super fresh ingredients straight from the garden, this is a simple recipe that’s sure to impress. It works well as an appetizer for guests, or you can even serve it as a light dinner or lunch along with some crusty whole grain bread and a salad. The star here are the zucchini flowers. Traditionally, zucchini flowers are stuffed and fried — which makes them a decadent but definitely unhealthy treat. These are baked in the oven which is the perfect makeover: it gives them a similar crispy texture on the outside and doesn’t lose any of the flavor. Step 1: De-stem the flowers. 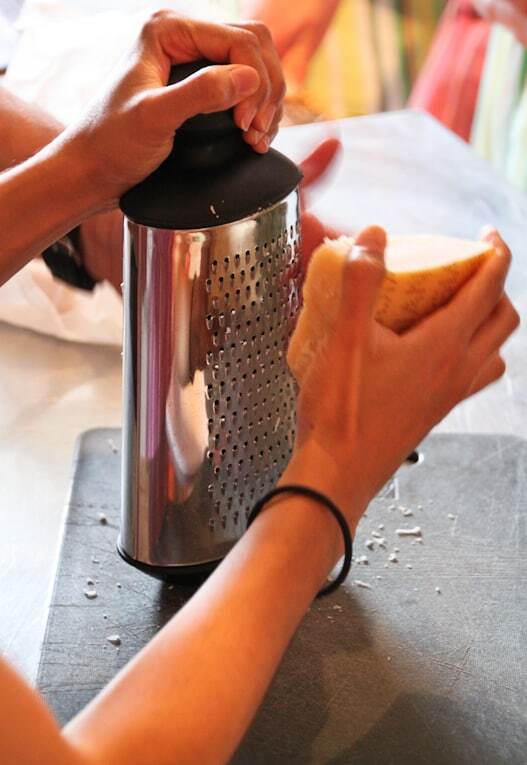 Step 2: Mix the ricotta with parmesan, a dash of salt, and nutmeg. Step 3: Put basil leaves in a blender with olive oil and a pinch of salt. Set aside (This will be used for plating). Meanwhile, put the ricotta mixture (about 2-3 Tbsp) inside each flower. Step 4: Put zucchini flowers in the oven, preheated at 350 degrees Farenheit for 2-3 minutes until the flowers are slightly cooked and the cheese has melted. 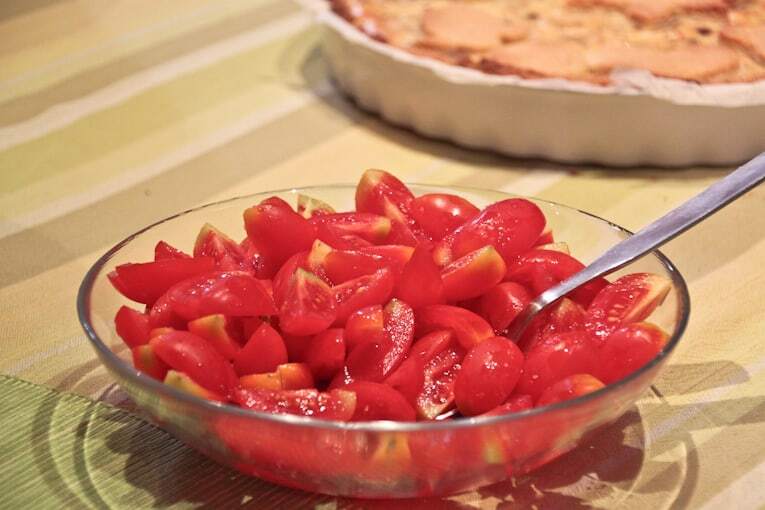 Step 5: Serve with basil sauce, chopped cherry tomatoes and a balsamic syrup. (3 stuffed flowers per serving). The husband and I couldn’t get enough of this dish. 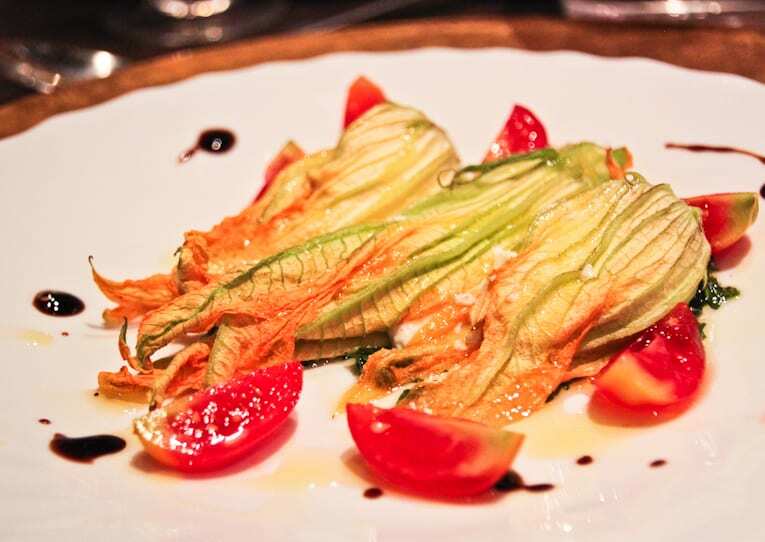 The creamy ricotta filling oozed out of the flowers when we took a bite, and the cherry tomatoes added just the right amount of acidity to the plate. It’s an easy way to bring Italy right to your home! 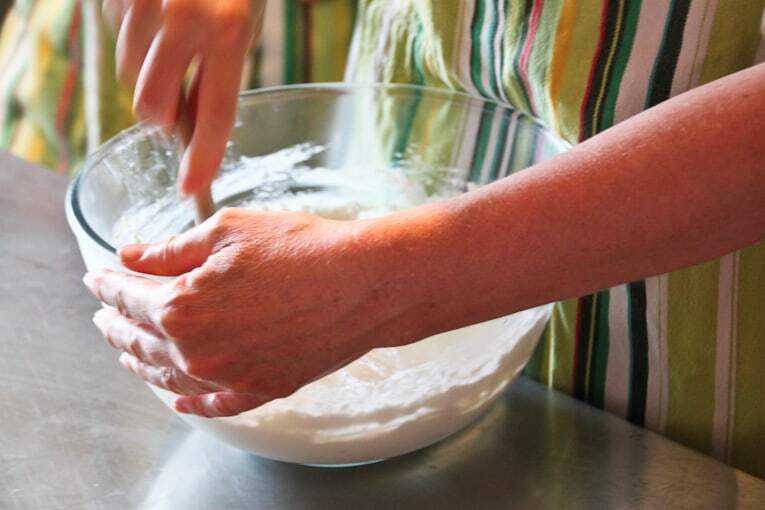 Mix the ricotta with parmesan, a dash of salt, and nutmeg. Put basil leaves in a blender with olive oil and a pinch of salt. Set aside (This will be used for plating). Meanwhile, put the ricotta mixture (about 2-3 Tbsp) inside each flower. 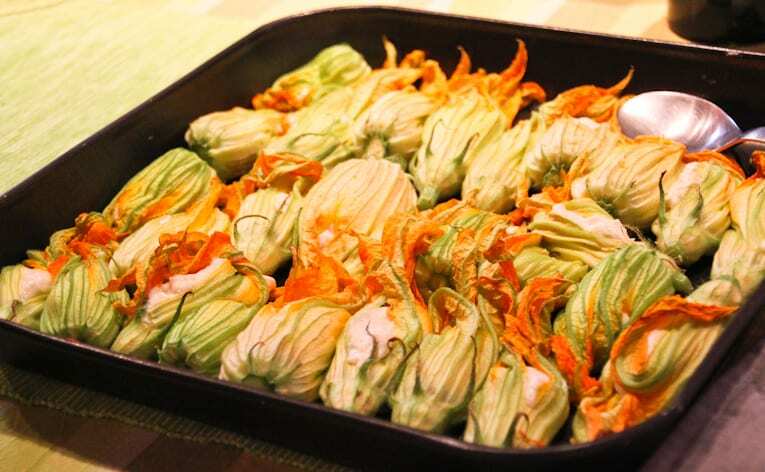 Put zucchini flowers in the oven, preheated at 350 degrees Farenheit for 2-3 minutes until the flowers are slightly cooked and the cheese has melted. 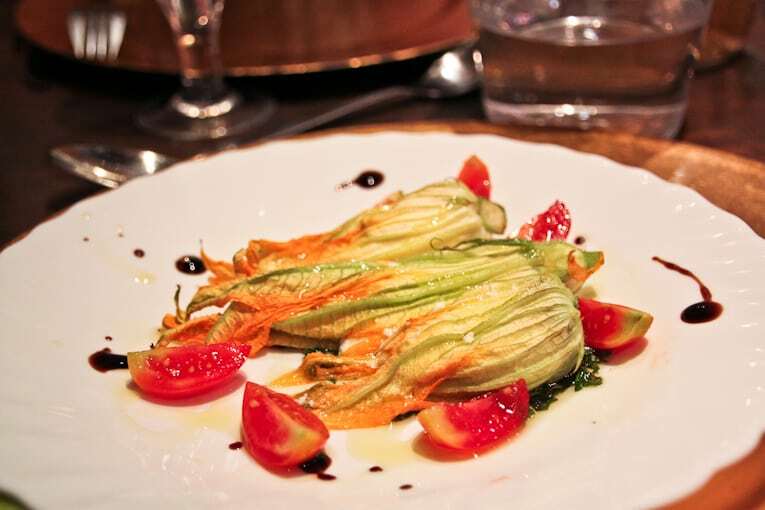 Serve with basil sauce, chopped cherry tomatoes and a balsamic syrup. (3 stuffed flowers per serving). Hi Kimberly! We didn’t ask the restaurants in Italy — so I honestly have no idea whether their cheeses were made with animal rennet or vegetable rennet. So sorry I can’t be more helpful! But I’d just ask when you go, I’m sure they’ll be able to tell you. And in the US, most cheeses you can find at the grocery store aren’t made with animal rennet so you should be good there! 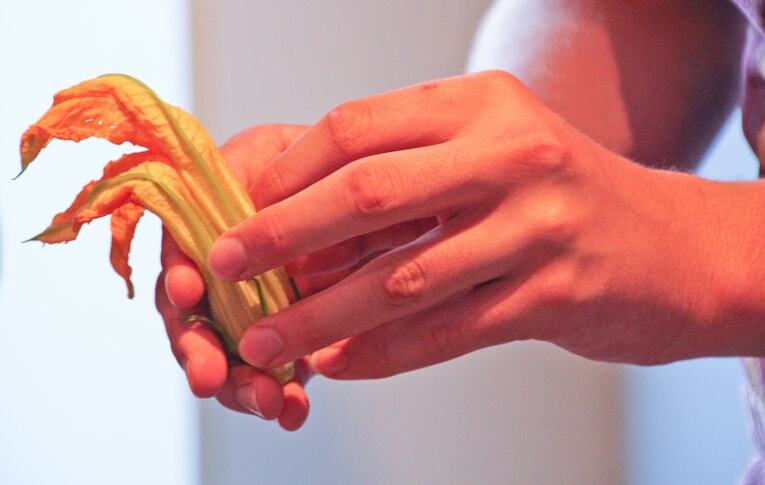 Ahhh yes – I’m not sure if you can get zucchini flowers in India! Not sure if they even grow there — but you should look in your local markets during the summer when they are in season. You never know, you might get lucky! 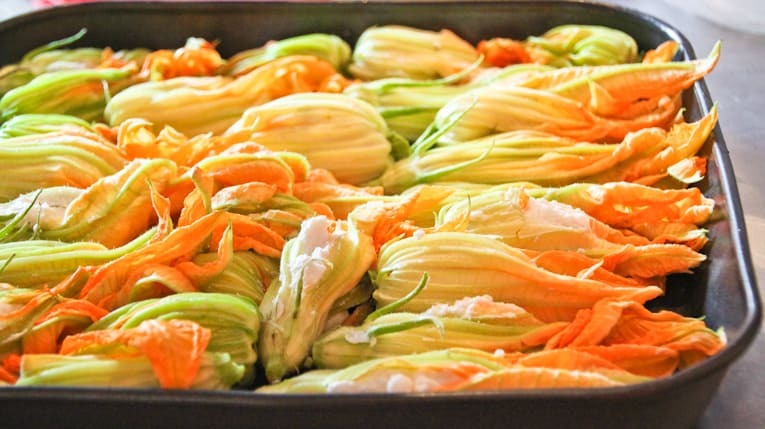 🙂 If you don’t find zucchini flowers, you can use this filling to stuff just about any vegetable and it will taste great. These look so good! 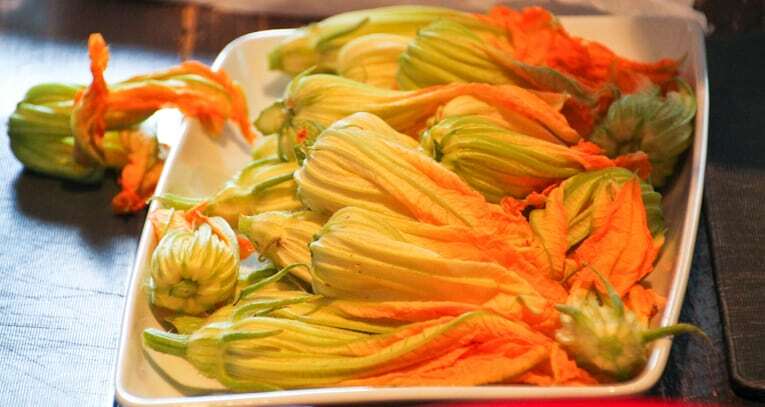 I’ve only had zucchini flowers that have been fried – which as you say are delicious but not the healthiest option. I’d love to try this recipe out!! Sounds so yummy and fresh tasting! Thanks Maria!! It really is a much lighter/healthier dish – you’ll have to let me know how it turns out for you! I love this recipe! I was used to have that very often in Italy. Thanks Melanie!! I’m sure you will love this recipe! 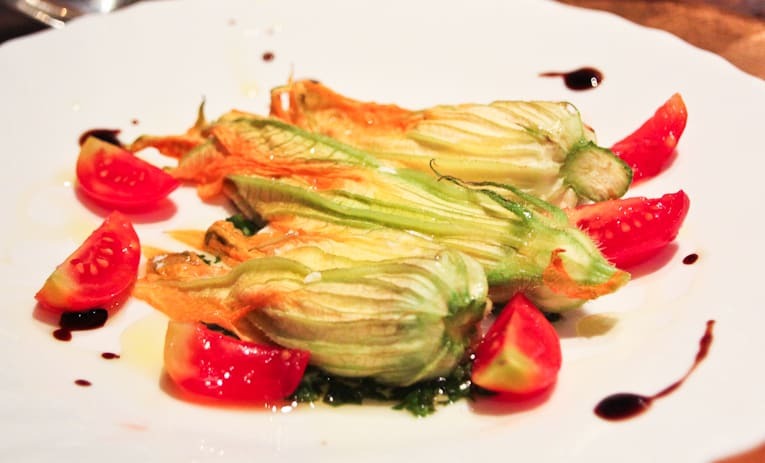 This summer I tried squash blossoms for the first time at Mesa Grill, Bobby Flay’s restaurant in Las Vegas. They were the deep fried version and absolutely delicious, but they cost $6 each! I have three zucchini plants and lots of tomatoes in my garden now so I’ll have to try your recipe. I love that they’ll be a lot less money and healthier since they’re baked. Oh that’s so amazing that you have a vegetable garden at home! That is one of my dreams when we have our own house (vs. an apartment 🙂 ). And yes, using veggies from your garden will make this a much more budget-friendly and healthy dish – can’t wait to hear how you like it!